Credit: HST Image: D.W. Fox, J.S. Bloom, S.R. Kulkarni (Caltech), et al. Explanation: What causes the mysterious gamma-ray bursts? 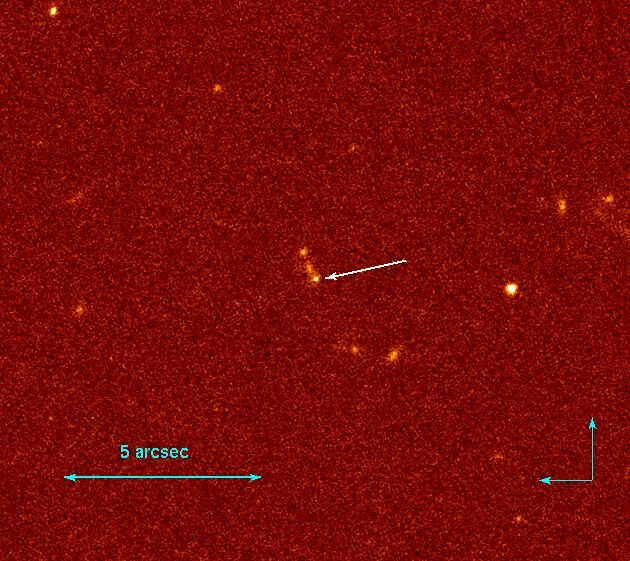 Indicated in this Hubble Space Telescope exposure of an otherwise unremarkable field in the constellation Crater, is the dwindling optical afterglow of a gamma-ray burst first detected by the Beppo-SAX satellite on 2001 December 11. The burst's host galaxy, billions of light-years distant, is the faint smudge extending above and to the left of the afterglow position. After rapidly catching the fading x-ray light from the burst with the orbiting XMM-Newton observatory, astronomers are now reporting the telltale signatures of elements magnesium, silicon, sulphur, argon, and calcium - material most likely found in an expanding debris cloud produced by the explosion of a massive star. 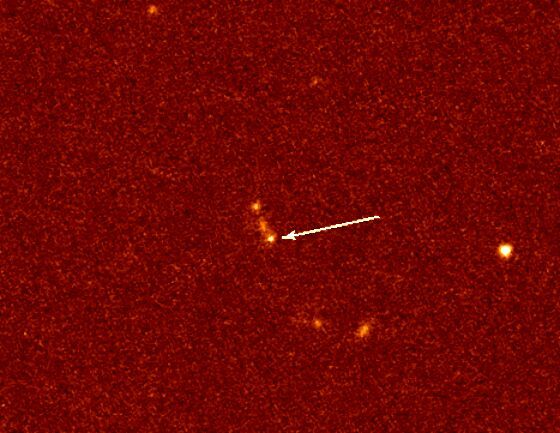 The exciting result is evidence that the gamma-ray burst itself is linked to a very energetic supernova explosion which may have preceded the powerful flash of gamma-rays by up to a few days.